Superhero Theme! Bring your superpowered spirit (costumes optional) and join us at the team tent for lots of fun! We strongly encourage Swim Team swimmers to attend Swim Meets! We believe that swimmers, especially early on in their swimming career, should find joy and success at every Swim Meet they attend. The amount of success a swimmer feels at a Swim Meet is directly correlated with their desire to attend future Swim Meets. Swimmers must be currently enrolled at Gold Medal Swim School to register for Swim Meets, no exceptions. 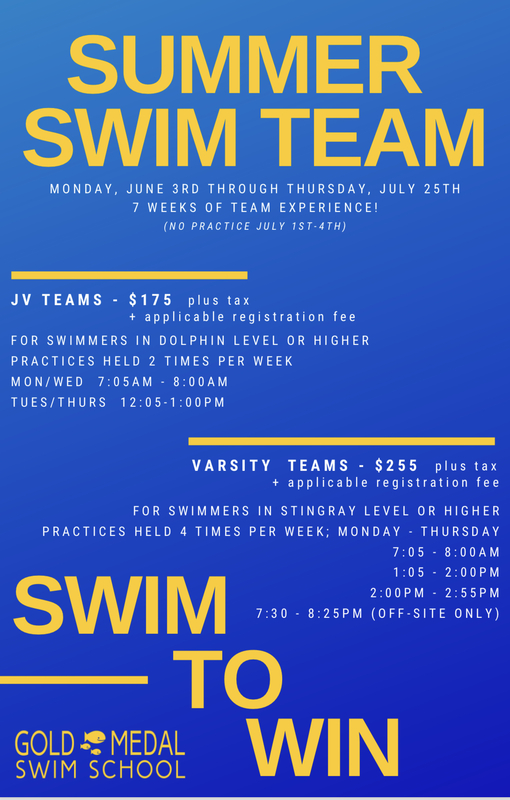 Swim Team I, Swim Team II, Swim Team III, and Competitive Swim Team members are eligible to participate in Spring, Summer, and Fall Swim Meets. Summer Swim Team members are eligible to participate in Summer (June and July) Swim Meets. Baby Swim (I, II, III), Learn to Swim (Starfish, Seahorse, Dolphin, Seal, Stingray), Private Lessons, Semi-Private Lessons, Boot Camp, and Adult Lessons (Beginner, Advanced) are NOT eligible for Swim Meets. To register for a Swim Meet, submit this form BEFORE 11:59 PM ON THE WEDNESDAY night before the Swim Meet. Registering at the time of the Swim Meet is not permitted as Swim Meets are pre-seeded. A registration fee of $16.00 per swimmer, per meet is due at the time of registration. A credit or debit card must be used to process payment. Swimmers may register for and compete in a maximum of five individual events per Swim Meet. At the Swim Meet, ribbons will be awarded to each heat. Upon submission of this Swim Meet registration form, you will receive an Automatic Reply email confirmation that your registration has been received. A payment receipt will also be included in the Automatic Reply email. Heat sheets will be available on the Swim Team Information page on our website one day prior to the Swim Meet. I agree to the information above regarding Swim Meets. *Swimmers of any age may enter "Open" events and swim at the 100 yds. distance. Please note, however, this is a combined event with the 12 & Over age group. Click here to register for Summer Swim Team!